This soup needs to make its place on your menu this week. 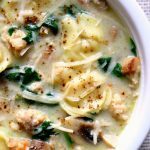 My husband said “this is maybe the best soup I’ve ever had!” It’s slightly creamy (but doesn’t go overboard with dairy) and has amazing flavor thanks to the chicken sausage. It also has a nice pop of color from the chopped spinach. Heat a pan over medium high heat on your stove top. Heat the oil for a couple of minutes. Brown the ground chicken sausage for 5 minutes. Add in the onions and saute for 3 minutes. Add in the garlic and saute for 1 minute. Add contents of pan to the slow cooker. Add in the thyme, chicken broth, mushrooms and tortellini. Cover and cook on low for 3-4 hours. Remove the lid and add in the parmesan cheese, spinach and half and half. If you’d like to thicken your soup a bit you can add a mixture of 2 Tbsp cornstarch and 2 Tbsp water to the slow cooker. Cook, uncovered, for about 30 minutes on high. Ladle into bowls and top with additional parmesan cheese. Enjoy!